An analog level trigger is similar to an analog edge trigger. With both trigger types, you specify the edge—rising or falling—and the trigger level. With an analog edge trigger, you are interested in the point at which the trigger condition is met. With an analog level trigger, on the other hand, you are interested in the duration that the signal remains above or below the trigger level. An analog level trigger is typically used with a Pause Trigger. The Pause Trigger asserts or deasserts when the trigger condition is met. 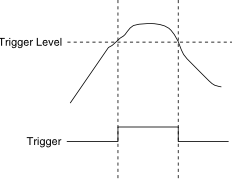 In the following illustration, a trigger asserts when the signal crosses above the trigger level and deasserts when it drops below it. The deassertion of the trigger could correspond to a Pause Trigger.